It’s been too long since I’ve gotten to work with new exposures and push my work into the new direction. I’ve been so busy hanging shows, and some of that is printing established work. And so I was excited to launch into one of the newer files. I had some writing I’d been thinking of to accompany it. Then this one caught my eye. I don’t know why it happens that something grabs me like this. Partly I think it is because as my skill increases, I know how I can pull something off, interpret it so it sings. When I made this exposure in 2015, I didn’t really see how this would work. Today it was pretty easy. Maybe I was grabbed by it because this morning was foggy with low clouds like this. Maybe tomorrow I couldn’t do it. It is all a mystery. When I made the exposure above, I also exposed this one, below, and that was something I “saw” pretty quickly as a silvery and subtle and textured work and published it on the site years ago. Now it has an infrared sister. One funny story about making these exposures: I pulled over in my little ancient VW Golf. One of the cameras I used was kind of big, a Nikon D800, and the other one was my Micro Four Thirds Infrared camera. So a guy pulls up in a big truck, sets up a big tripod (I haven’t used a tripod that big since I had a bellows camera on top of it), and sets up a big DSLR. I thought the D800 was too big, and I don’t know how a DSLR could get so much bigger. Maybe a battery grip added onto some monster camera? I think it was a Can-Nikon offering and not a medium format camera. Anyway, I felt like little old me with my little plunky gear, and I thought probably the scene was too common if someone else was set up there, and set up so grandly too. I figured I wouldn’t do anything with the exposures. 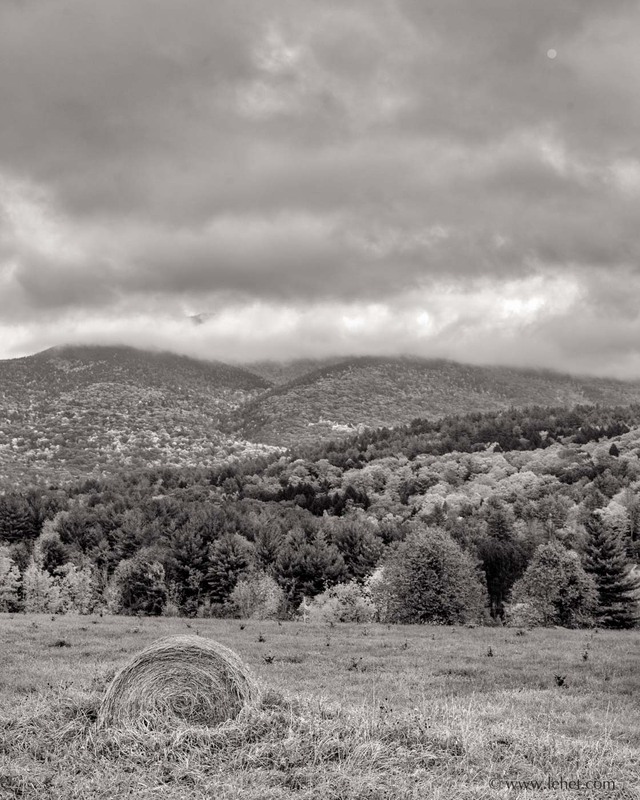 It was mid fall, already late in the foliage season, and the colors were subtle and maybe interesting. I think it was the fact someone else was making photographs there that pushed me to interpret it as I did, all silvery textures instead of some punchy colors. At this point I’d love to see if he got anything good in that spot. 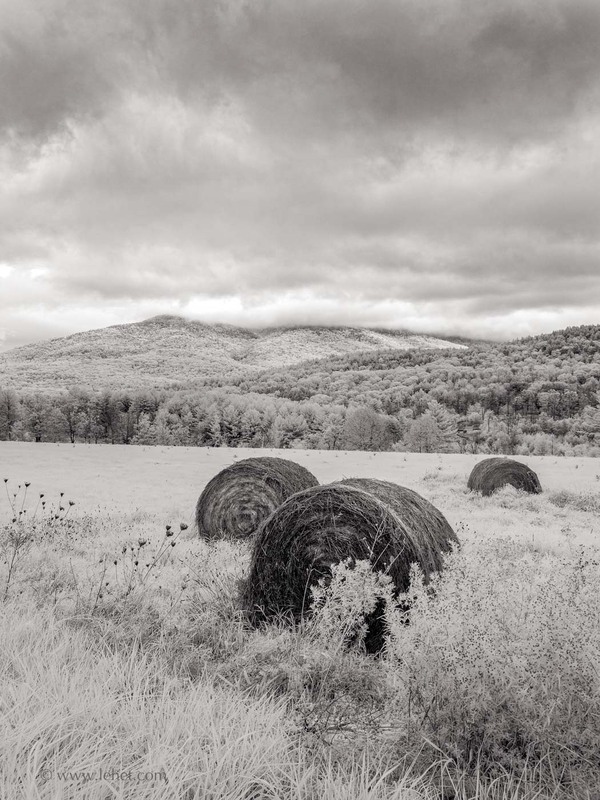 This entry was posted in Autumn, black and white, Fog, hay bales, Infrared, Landscape, New England, Vermont on August 15, 2018 by john lehet.